Chooks-to-Go Pilipinas roster announced for FIBA Asia Championship Cup 2017 - Balita Boss! 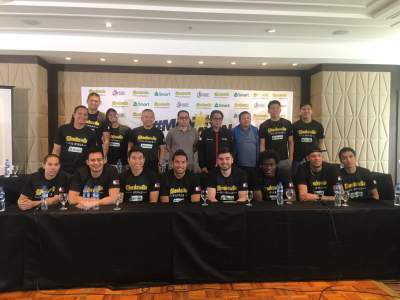 Chooks-to-Go Pilipinas announced on Tuesday, September 19 their 12-man roster that will battle in the 2017 FIBA Asia Championship Cup in China starting Friday, September 22. After winning gold in the last SEA Games, Kiefer Ravena, Almond Vostros, Raymar Jose and Carl Bryan Cruz are selected to play for the banner Chooks-to-Go with brothers Jeron and Jeric Teng. The line-up also includes Alfrancis Tamsi of Far eastern University (FEU), TNT KaTropa’s Norbert Torres as well as the University of the Philippines (UP) Fighting Maroon player Jett Manuel. Import’s will be Isaiah Austin and CEU's Rod Ebondo while Andre Paras and Gab Banal are listed as the team's reserve players as the team is still working in the processing of the Visas of the two mentioned imports.